This is the last video of a 3-part series on celiac disease and gluten sensitivity. In this video, I discuss important strategies for managing celiac disease and living a healthy, gluten-free lifestyle. I also share some troubleshooting tips and possible reasons why you may not feel better after going gluten-free. Hi, and welcome back to our channel. This video is part 3 of a 3-part series on celiac disease and gluten intolerance. In part 1, we talked about what celiac disease is, how it develops, and what the common symptoms are. 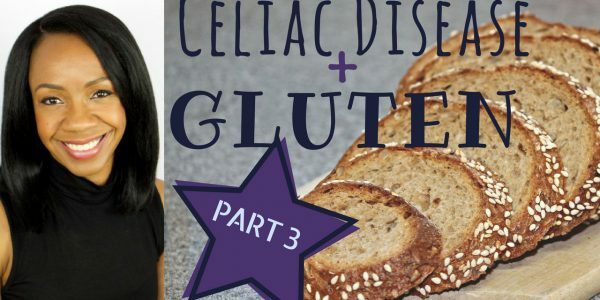 In part 2, we talked about who gets celiac disease and how it’s diagnosed.So today’s video, part 3, is all about what to do after you’ve been diagnosed, how do you manage this condition with your health care provider, and does it really mean to live a gluten-free lifestyle. And out of all the information I’ve shared across this video series, I feel that today’s topic is the most important. Okay, so let’s jump in. First I want to talk about what you should do if you’ve just been diagnosed with celiac disease, because it’s not enough for your doctor to just say, “Go on a gluten-free diet, and then you’ll be cured, and have a nice life!” There’s actually quite a bit of important testing and follow-up that you should have on a regular basis. First, you have to learn how to truly avoid all sources of gluten in your diet. Now, I know that the gluten-free diet can seem confusing at first, but it’s actually less difficult than it seems. And once you really learn the basics and get some practice, you’ll be able to easily identify whether a food is gluten-free or not. One thing that I want to make very clear is that there is no “moderation” with gluten if you have celiac disease. So it’s not a question of “how much gluten can I safely eat?” because the answer is none. Every time you ingest gluten, even trace amounts, it’s causing some level of intestinal damage. We know that 1/8 of a teaspoon causes visible intestinal damage. And amounts less than that will still cause inflammation and damage. Also, the inflammation that occurs after a single exposure can take 6 months or longer to finally calm down. So if you’re “cheating,” even on rare occasions, there’s going to be a constant state of inflammation going on and that prevents healing. It’s like if you scrape your knee and you keep rubbing and scratching the wound, it will never heal – you have to stop irritating it and give it a chance to heal. How do you avoid gluten? Remember that gluten is a protein found in certain grains, so that means foods like bread, pasta, crackers and baked goods usually contain gluten. Anything made with wheat, rye, barley, couscous, spelt, kamut, triticale, einkorn, spelt or bulgar should be avoided. Some of the grains and pseudograins that do not contain gluten are rice, buckwheat, corn, sorghum and quinoa – just to name a few. Oats can be gluten-free if they’re labeled as certified gluten-free – meaning they haven’t been cross-contaminated with gluten at the manufacturing facility – but you have to be very careful because some people with celiac disease react to the proteins in oats as if they were gluten. I’m going to link below to a study that talks about this issue. And speaking of cross-contamination, it’s important to pay attention to the multiple ways that gluten-free foods can become contaminated with gluten and make you sick. For example, French fries that are fried in the same oil as breaded chicken nuggets or mozzarella sticks, donuts, etc., will contaminate the French fries. Also, traces of flour dust on the countertop, or crumbs that stick to the butter after people have spread it on their bread – those are common sources of cross contamination. The bulk bins at the health food stores could be problematic because the different flours are in such close proximity to each other, and lot of people use the same scoop to get foods out of the bins. Utensils and cookware are really important to pay attention to. If you live in a household with people who are not gluten-free, then I recommend having separate cutting boards, knives, bakeware, and other kitchen items for anything that comes into contact with gluten. Wooden spoons especially have a lot of nooks and crannies where gluten can hide. You may also want to dedicate a specific counter surface as “gluten-free only” and be sure to clean it with soap and water before preparing any gluten-free food on that surface. Do not double-dip anything. So if a serving utensil goes into a jar, then touches gluten, then goes back into the jar, it’s now off limits. I think about things like peanut butter, salsa, jelly and butter. You also have to be very careful about cosmetics, especially lip products. A lot of lipsticks contain wheat starch, wheat germ oil or other sources of gluten, and that can be very problematic. There’s a great resource called Gluten-Free Makeup Gal, and you can sign up for their list of gluten-free cosmetics. I’ll leave the link for that below. Also, some shampoos, lotions and skin care products contain wheat proteins. It’s controversial whether gluten that’s applied topically can cause problems, but I know that some people can get skin irritation from these products, and I personally don’t think it’s worth the risk since there are so many gluten-free personal care products to choose from. At restaurants, you’ll need to make sure that your server understands the severity of your situation and actually communicates with the kitchen staff. Sometimes it’s not enough to say, “I’m gluten-free.” It’s better to say that you have a gluten allergy because restaurants take allergies more seriously. Make sure that they understand the safe rules for pans, cutting boards, knives and gloves. Thankfully more and more restaurants are accommodating people who can’t have gluten, and there’s even an app called findmeglutenfree, where you can find restaurants that are either dedicated gluten-free or very knowledgeable on how to prevent cross-contamination. Another important thing to investigate after you’ve been diagnosed is nutritional deficiencies. Even if your symptoms are mild, it’s important to have your health care provider test you for vitamin and mineral deficiencies. Because long-term damage of the small intestine can really get in the way of your body’s ability to absorb your nutrients. Deficiencies of B-vitamins like B12 and folate, also calcium, iron, zinc, and Vitamin D are very common in people with unhealthy guts. We call this malabsorption because the nutrients aren’t being absorbed. So you need a comprehensive workup for a wide range of nutrients that you might be missing. And if your doctor doesn’t think that this is important, you should find a new doctor! Another important step, in addition to checking your food, cosmetics and personal care products for gluten is to check your current medications and nutrition supplements. Believe it or not, some prescription medications contain gluten in the form of binders, fillers, or other “inactive” ingredients. There are even some nutrition supplements that contain ingredients derived from wheat or other gluten sources. So you really need to go through every single thing that you’re ingesting or using on your body – foods, medications, etc. – and check for sources of gluten. If you aren’t sure whether a medication or supplement contains gluten, do some investigating online and don’t be afraid to contact a pharmacist or even the manufacturer. I will say that finding gluten on labels is not always easy because the names of the ingredients are not always obvious. There are a lot of ingredient names that don’t sound anything like wheat or gluten. So this is where good education and good information comes in handy. One of my favorite resources for learning to understand ingredients is this book, The Paleo Approach by Dr. Sarah Ballantyne. This is such a good resource for not only understanding ingredients, but also how to have a healthy gut and live a healthy lifestyle. And she has these really comprehensive lists in the back of the book that help you understand all of the different ingredient names for gluten, soy, dairy, etc. So I definitely recommend this book if you don’t already have it. I’m not affiliated with Dr. Ballantyne – I just love the work that she does and I think this book is a great resource. Another important thing to be aware of if you have celiac disease is having your doctor monitor your bone density . And that’s because years of calcium malabsorption can make bones brittle. You may also want to screen your family members since celiac disease is genetic. If someone else in your family has it, it’s better to catch it early before a lot of damage has been done. You should also plan to monitor your blood antibody levels, thyroid hormones, and nutritional markers like iron, calcium, b-vitamins, and vitamin d. Keep in mind that in some cases it can take up to three years on a gluten-free diet for the blood antibodies to normalize, but its still a good idea to have a celiac blood panel checked every 6-12 months, or according to what your doctor recommends. Your doctor may also recommend yearly cancer screenings, and that’s because people with celiac disease are more vulnerable to developing certain types of cancers. So at your yearly physical, they should be checking your lymph nodes, performing a breast exam, and possibly even a rectal exam or another test to see if there is any blood in your stool. Now all of this might sound like a lot, but remember that this is a chronic condition that should be monitored. Okay – so you’re doing a great job avoiding gluten, but what if your symptoms aren’t going away and you’re not feeling any better? This could mean several things. The most important thing to consider is accidental gluten exposure or gluten cross-reactions. For example, maybe you ordered a gluten-free burger bun at a restaurant, but they grilled it on the same surface where they grill their wheat buns. Or maybe you’re eating a certain food that your body is reacting to as if it were gluten. In part 2 of this series, I talked about how your body can still think you’re eating gluten even if you’re not, because the proteins in certain foods can trigger the same type of immune response that we would see with gluten. It’s not uncommon for people to react to oats, potatoes, coffee and dairy in the same way that they’d react to gluten, and sometimes they don’t notice the symptoms right away when they eat the food. So sometimes a good food allergy test is in order to see if you’re reacting to more than just gluten. Another reason that you might not be healing on a gluten-free diet is that you haven’t healed the intestinal inflammation yet. It can take several months or longer for the inflammation to subside, and I have found that avoiding all grains is an important part of this process. Grains of any kind have proteins that are very resistant to our natural digestive enzymes, and they can really damage our intestines. Also, a lot of the grains like rice and corn that are used in “gluten-free” convenience foods like gluten-free breads, crackers and noodles, are full of starches that can feed harmful microbes in our gut. And when the microbes eat these starches, they give off harmful gases and poisons that further damage the gut. Those starches also raise blood sugar really high – even worse than white sugar. So I really caution against overindulging in gluten-free products that are made with starches like rice, corn, tapioca, etc. because it really can hinder the healing process, and some people develop more inflammation. My favorite diet for getting intestinal inflammation under control is called the Specific Carbohydrate Diet or SCD. It’s been very well studied, and I’ve used it for myself and for a lot of my patients. You can easily find a lot of information about this diet online, and I’ll also link to some of my favorite SCD cookbooks below. Finally, if you’re not healing or feeling better on a gluten-free diet, you may have another health issue going on like a gut infection or poor digestion. I hope you found this video series helpful, and I encourage you to keep looking for answers if you have unexplained symptoms, because most people with celiac disease never get diagnosed. Sometimes celiac disease or gluten intolerance is the missing piece to a lot of chronic health issues. Thank you so much for spending time with me today, and I especially want to thank those of you who take the time to comment and subscribe to our channel. We do read every single comment, even though we don’t always have time to respond. But we still very much appreciate all of you and you’ve given us a lot of great ideas for future videos. Be sure to hit the like button if you enjoyed this video, and I’ll see you next time!